The United Nations Environment Programme Finance Initiative (UNEP FI) welcomed its first member from the finance sector in Turkey. 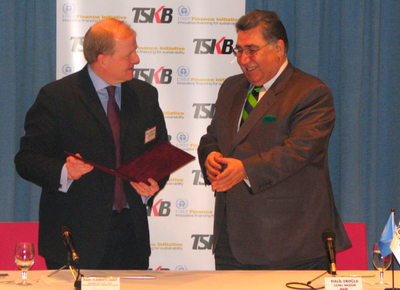 The membership of the Industrial Development Bank of Turkey (TSKB) became official at a signing ceremony, after Paul Clements-Hunt, Head of UNEP FI, and Halil Eroglu, TSKB’s Central Executive Officer (CEO), signed the ‘UNEP Statement by Financial Institutions on the Environment and Sustainable Development’, as a sign of future cooperation in the area of sustainable finance. Extending its outreach to the finance sector in Turkey, UNEP FI takes the lead in developing the much needed cooperation on environmental and social issues. As a global UNEP public private partnership of more than 180 institutions, UNEP FI’s programmes shall from now on include specific capacity building projects in Turkey, among other initiatives. On the day following TSKB’s signing ceremony, UNEP FI’s Head of Unit Clements-Hunt presented the case for sustainable finance before a wide audience of bankers at a conference in Istanbul, entitled ‘The Significance of Environment for Financial Institutions and Sustainability’. The conference was organized by the Banks Association of Turkey. UNEP FI’s new member TSKB chairs the Association and hopes to set an example, which is to be followed by other Turkish financial institutions willing to understand the environmental and social impacts on the financial sector. Paul Clements-Hunt, Head of UNEPFI: ‘At UNEP FI we are proud and delighted to welcome our first member from Turkey. As a UN agency, we help financial institutions worldwide in understanding sustainable finance. We further assist them in building capacity and encourage the use of our training programmes and tools. Reaching out to the Turkish financial sector and aware of Turkey’s important geo-strategic role, we look forward to strengthening the partnership with TSKB as our first Turkish member. And this is only the start.’ Halil Eroglu, CEO of TSKB: ‘We see our duty as assuming a leadership role in creating awareness on the matter in the sector. We at TSKB attach significant priority to the environment and sustainable development and carry on our efforts in this direction. By acquiring this membership, we will sign up for a number of good projects and draw attention to the importance of environmental impacts in the Turkish financial sector.’ Read the Press Release.